My husband and my littlest one are out of the country, and who wants to cook for only the four of us currently at home? But I decided to make a quiche, since one would do for all of us. I was out of mushrooms, so I used the fresh winter squash I had just picked up in my sale across the street. I wasn’t sure my pickier kids would eat it, but they said they liked the squash in the quiche. Just not on its own. Prepare crust and place in pie or quiche dish. If making fresh, pre-bake for 5 minutes. Place squash and onion on a baking tray and spread with oil. Bake at 200 C. (400 F.) for 10 minutes. You can do this while the crust is baking. 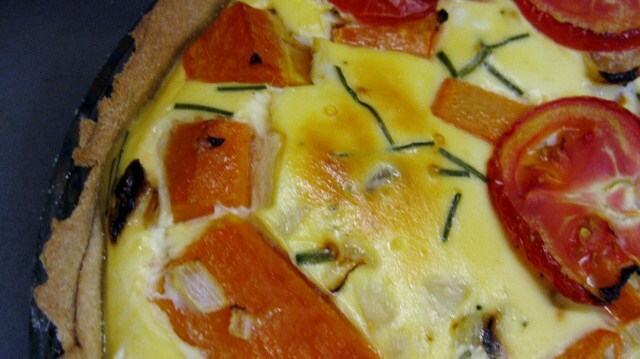 The vegetables don’t have to be completely soft because they will finish cooking in the quiche. Place the roasted vegetables in the crust. Mix eggs, cheese, milk, rosemary and chives in a bowl and pour over the squash. Decorate with sliced tomatoes (optional). Bake at 180 C. (350 F.) until brown on top, about 30 minutes. Want something even easier? Try Universal Crustless Quiche. Hannah is winter squash דלורית and do yo uthink I can use pumpkin instead? I have to laugh – I “only” cook for 3 regularly! Ariela, winter squash is a generic term. I used pumpkin, but it’s not the save as American pumpkin. I made this for dinner last night with the pie crust that you recommended and it came out fantastic! I was so proud of myself. I didn’t have rosemary or chives so I used fresh basil. It was just great and easy. I had it from before. But I admit to being kind of ambivalent about the boycott. What a great recipe! I love to serve dairy dishes as a change of pace. Looks and sounds very tasty and healthy too. The oil crust is very interesting. What percent of whole wheat flour do you like to use in it? Also, why is there a step of first microwaving it–to save time? Faye, thanks much for your question. It was meant as two alternatives, and I updated the crust recipe so it’s more clear. Either the microwave or the conventional oven. It’s a fine unprocessed whole-wheat flour, with 10% of the toughest fibers sifted out. I don’t dilute it. Thanks, Hannah. Sounds great. I like your way of precooking the vegetables by brief roasting too. When you bake the crust without a filling, does it behave well even if you don’t “blind bake” it with pie weights or beans? Faye, I’m too lazy to use weights. There was a little bubble but no big deal.